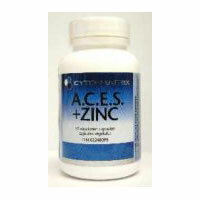 This basic antioxidant formula is complete with vitamins A, C, E and minerals selenium and zinc. The addition of Zinc to this formula optimizes T-lymphocyte production. Ingredients Each capsule contains: Ingredient	Amount Vitamin C (Ascorbic Acid)	500 mg Beta carotene (pro-vitamin A)	7,000 IU Vitamin E (d-alpha tocopheryl acetate)	160 IU Selenium (Selenium citrate)	50 mcg Zinc (Zinc citrate)	10 mg Available in 60 and 120 vegetarian capsules/bottle Directions: Take 1 capsule 3 times daily or as recommended by practitioner.